An Indian international full-service airline based out of Mumbai, Jet Airways is the second largest airline in terms of passengers carried and market share in India. Jet Airways was founded by Mr. Naresh Goyal as an air taxi on 1st April, 1992 and the airline started its commercial operations on 5th May, 1993 with four leased aircrafts leased from Malaysian Airlines. 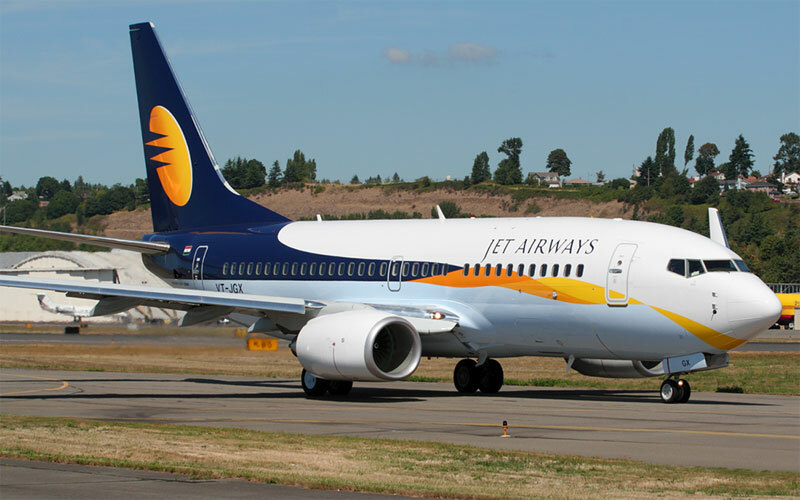 Jet Airways has its primary hub at the Chhatrapati Shivaji International Airport, Mumbai, and its secondary hubs at Bengaluru, Chennai, Delhi, Kolkata and Pune. Initially, Jet Airways operated only on domestic routes and the airline began its international operations in March 2004, the first international route that Jet Airways operated on was from Chennai to Colombo. Jet Airways sold 24% of its stake to Etihad Airways on 24th April, 2013 and entered into an agreement which has allowed seamless travel for passengers. JetLite was a wholly owned subsidiary of Jet Airways. Jet Konnect is the low-cost brand of Jet Airways which launched on 8 May 2009 and fly on same airline designation as Jet Airways. The Subsidiary of Jet operates both, fleet of ATR 72-500s and Boeing 737-800s. Jet Airways – On-Time, Low Fares, Courteous, Hassle-Free, Full-Service Airlines, Online Flight Ticket Bookings India and Abroad, Discount Airfares, Domestic and International Airline Tickets India. Jet Airways offers reliable, efficient and hassle-free operation at the best possible fares! Jet Airways operates on a mixed fleet of 104 aircrafts. The Jet Airways fleet includes aircrafts from the Airbus, ATR and Boeing families. This fleet ensures to cater for all their short, medium and long-haul flights. Jet Airways serves 64 destinations including 44 domestic and 20 international destinations in 15 countries across Asia, Europe and North America. Jet Airways is a full cost carrier, hence its aircraft cabins are divided into different classes. These cabin classes are: First Class, Premiere and Economy. When travelling on International routes the amenities offered are different from those offered while travelling on domestic routes. First Class (available only on international routes) offers passengers their own private suite, with sliding doors offering you complete privacy and more comfort than one can imagine. First Class also offers you a private wardrobe. Passengers can personalize their five course meal from an array of international cuisine and also choose from a wide collection of fine wines and whiskies. Premiere Class offers 1-1 seating plan which offers aisle as well as window seats for all the passengers, all seats have access to a laptop plug-in socket. Premiere Class features include flat beds with a small wall to ensure privacy. Premiere Class offers passengers with a ‘Dine Anytime’ feature; passengers can choose to eat their meals at anytime during the flight. In the name of in-flight entertainment Premiere Class features a 15.4 inch, touch screen LCD TV with access to the latest Hollywood and Bollywood blockbusters. Economy Class offers seats designed to allow passengers to stretch their legs, the 6 way headrest provides full comfort for long-haul flights. Passengers travelling Economy are provided a choice between Indian and International cuisines. In the name of in flight entertainment Economy Class features 10.6 inch touch screens with access to the latest blockbusters and TV shows. Jet Airways operates a frequent flier program by the name of JetPrivilege. Members of JetPrivilege have dedicated check-in counters, additional baggage, lounge access, priority baggage, tagging and easier reservations. Book tickets for 10 travellers or more with the premium international airline Jet Airways by FareHawker flight Group Booking desk. We offer Jet Airways Airlines group fare facility for all travel portal, travel agencies, corporate & tour operator. Our ex-airliner team members are expert in handling small or large segment of Group Bookings. Jet Airways Airlines Flight Lowest Group Fare - Buy Group flight tickets with FareHawker for booking domestic airlines group tickets on discounted fare. We are the largest consolidator for Group Air tickets in India. How to book Group Tickets in Jet Airways Flight ? Any traveller, corporate, travel agency or individual can directly mail to FareHawker GroupDesk team by asking for Jet Airways flight group fare. Our group booking expert will get back to you on the same trail within 4 hours. Air ticket booking available at lowest airfare for Jet Airways flights at affordable prices at FareHawker. Jet Airways flight online booking - Book Jet Airways Airline ticket online at lowest air fare at FareHawker. Get best offer for Jet Airways Airlines, the premium international airline flying throughout India and abroad. Book Jet Airways Airline tickets with FareHawker as we offer the best-in-class fare options for all types of airline bookings. Our dedicated ex-airliner team with their in-depth industry knowledge offers you the cheapest possible fares for domestic as well as international travel. We take pride in our relationship with the airline partners and it is this relationship that allows us to offer you great travel solutions. We are here not only to find the best flights at cheap airfares but also to offer you consolidated travel services so you enjoy a seamless travel experience. Visit Jet Airways FAQ for all related queries. Terms and condition of FareHawker and Jet Airways apply.